Here's the worst Google organic search result I've seen in a while. One of the search analysts in the office pointed it out to me. When I pointed it out to Google their response was: Good catch. Thanks. It'll be interesting to see what happens next. 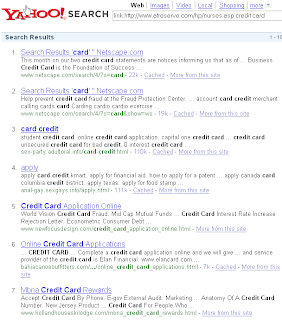 The search term is [credit card] and it is not a Personalised Search result. Using Yahoo's SiteExplorer you can see that they have back links from some pretty bad sites. They've links back from good sites too, often due to the page's good organic results. One easy hunch is that we're looking at a scraper network that's evolved into the sneaky redirects. Now, there are sites like this one which are just scraped spam (with the noarchive tag too) and which do link to the mysteryly ranked Afreserve page. However, these scrapers could well have Afreserve content because Afreserve ranks highly for the competitive credit card term.